When sugar cane is ground it produces a thick, creamy, almost liquid substance, very rich in sugar, and of a beautiful amber colour. This is the molasses, traditionally called "honey". This "honey" is the main raw material, and its unique quality has given Cuban rum the prestige it has always enjoyed. A special yeast will be added to the purified, sterilised and diluted "honey" to initiate the fermentation process. The fermented honey is now ready for the slow reflective process of evaporation and concentration which will take place in the distillation columns. The distillation process yields eau-de-vie and pure alcohol. The young eau-de-vie then begins its first maturing period in 180 litre barrels, where it remains for at least 18 months. The well-balanced blending of aged eau-de-vie, matured for at least 18 months, with sugar cane alcohol of the highest quality will produce the young rum, which will rest once more in white oak barrels, where it will remain for three years, hence its name: Anejo 3 years. Once the product has matured the expertise of the rum master will come into play in selecting and blending the barrels, and then the product will be rested and filtered to ensure uniform batches of 3 year old rum identical in aroma and taste. 3-year-old rum has a light straw colour. It has at once the luminous, light, syrupy look characteristic of aged rum. This Cuban rum has a sweet, woody smell with aromas of caramel and vanilla. 3-year-old rum is pleasant-tasting with a fresh, discreet flavour. A taste of vanilla with chocolate accents. The three year old rum, excellent for cocktails, providing the cocktail with the distinctive characteristics of rum. It is also ideal for drinking on its own or with a few ice cubes. 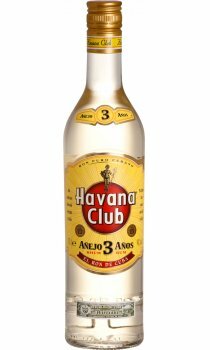 Havana Club 3 years was awarded the silver medal in London in 1996 at the "The International Wine & Spirits Competition" when judged against the best rums in the world. If you drink bacardi give this try, you'll not look back. More flavour and elevates any cocktail to a higher level. The best white rum? certainly is for me. Makes the best El Presidente cocktails as recommended by the Pima bar at the Hilton. Superb. This rum is the best ive tried for Cuba Libre's. So nice and easy to drink. THE rum to use in your Pina Coladas, and any cocktails that call for a light rum. This aged rum adds a complexity and refinement to cocktails that I just don't feel you get with 'Blanco' rums. I also use this in daiquiris although some feel the taste interferes with the 'cleanness' of the simple drink, I prefer the sweeter taste and complexity this rum offers.